Order your Sterling StingRay Ray35 Bass Guitar Koa Top from AMS and enjoy 0% Interest Payment Plans, Free Shipping, Free Extended Warranty & 45 Day Money Back Guarantee. The Ray35-Koa bass features a select, even grained African Mahogany body, offering a rich, round sound for a deep bottom end, pronounced mids, and clear voiced highs. The spotlight centerpiece is the body top and headstock overlay featuring the crown jewel of the islands: Genuine Figured Hawaiian Koa. Arguably one of the most beautiful woods on the planet, it comes from the rich, fertile soil of the islands, and imparts a stunning beauty that until now, had been found only on the sought-after Ball Family Reserve instruments. The ‘modern’ StingRay 5 body design was an instant hit when released 30 years ago in 1987, instantly becoming the industry standard for extended range bassists worldwide. Our Sterling by Music Man Ray35-Koa pays tribute to that iconic Music Man StingRay 5 bass design in look, feel and powerful, punchy sound. The electronics are feature packed and include a 3-position pickup selector that allows the player to choose from: Series, Parallel, and Series with Filter. The triumvirate of the AlNiCo magnet in the Music Man designed humbucker, the tones from the Music Man designed 3-band preamp and 3 position pickup selector truly capture that “StingRay Sound” and showcase the incredible versatility of the Ray35-Koa. 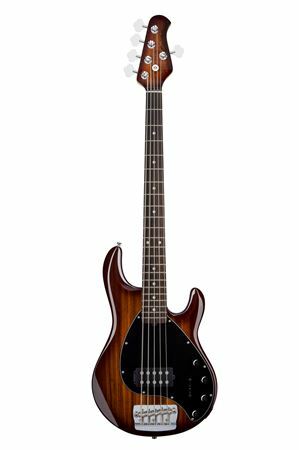 The Ray35-Koa Sterling by Music Man bass bridge is modeled after the heavy-duty Music Man design and features 5 fully adjustable and intonatable steel barrel saddles for fantastic tone. Similarly, the tuning keys on the 4+1 trademark design headstock are also of rugged, 20:1 ratio, heavy duty design. Whether at home or on the road, all of the hardware will give the player years of trouble free, accurate playability. Manufactured in Korea by Master Craftsmen, the Ray35-Koa is truly a benchmark instrument for the Sterling by Music Man line. Probably the best bass I ever owned! I must say this is probably the best bass I've ever owned. This is the first bass I bought for the look as much as the sound and quality. Everybody was complimenting me on my beautiful new bass! Played my first gig with it shortly after it arrived and it sounded great! The set up out the box was perfect. I am VERY satisfied with this bass!